Fiberglass insulation is a building material made from tightly-woven glass fibers. It is sold in large rolls known as blankets or batts and is the most widely used type of insulation in the U.S. The history of fiberglass stretches back more than a century and helps to highlight the potential benefits and drawbacks associated with this material. The first finely woven glass fibers, called mineral wool, were produced in 1870 by an inventor named John Player. At the 1893 World's Fair, spectators were able to view an elaborate dress made from fiberglass cloth. It wasn't until 1938 however, that the first fiberglass insulation was produced. It was invented by the Owens Corning Company, which is the world's number one producer of fiberglass to this day. Since its invention in 1938, Owens Corning had used asbestos fibers when producing fiberglass insulation. By the late 1970s consumers and health organizations established a solid link between asbestos and lung disease. In 1980, asbestos production was banned throughout the U.S. and many other countries. Owens Corning declared bankruptcy in 2000 to reorganize after an onslaught of lawsuits related to asbestos. The company has since reclaimed its position as the world's top insulation producer. Fiberglass insulation produced before 1980 should only be removed by a professional remediation company. A 1994 report by the International Agency for Research on Cancer (IARC) listed fiberglass as a human carcinogen, according to the American Lung Association. To warn users about the danger of this product, OSHA and the IARC require that all fiberglass insulation packages contain health warning labels. As of 2009, these labels are still required, despite a 2001 IARC report that fiberglass is not a likely carcinogen. Fiberglass insulation is widely available in the form of batts or blankets, but newer forms are also available. Batts lined with vinyl can help reflect light or sunlight while increasing the insulating value of this material. Loose-fill fiberglass can be sprayed into inaccessible spaces, similarly to the use of cellulose insulation. Very dense fiberglass blankets are often used to line ductwork to reduce heat loss and minimize condensation. Fiberglass insulation remains the most popular insulating material because of its low price and easy installation. According to the U.S. Department of Energy's Energy Savers program, fiberglass has an R-value between 2 and 3. This is very low compared to other materials, making it a relatively poor insulator. Because of its low cost, however, builders simply use many layers of fiberglass to match the insulation levels of more costly products like rigid foam. Emily Beach works in the commercial construction industry in Maryland. She received her LEED accreditation from the U.S. Green Building Council in 2008 and is in the process of working towards an Architectural Hardware Consultant certification from the Door and Hardware Institute. She received a bachelor's degree in economics and management from Goucher College in Towson, Maryland. 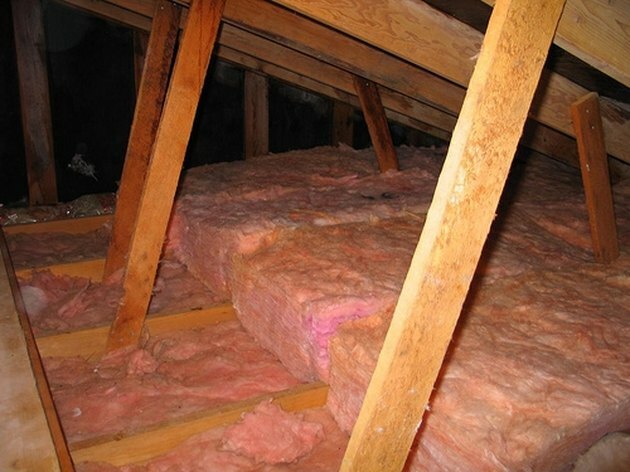 What Is the Difference Between Pink Fiberglass Insulation & Yellow Insulation? How Does Fiberglass Insulation Work? What Are the Dangers of Fiberglass Insulation?